Anderson has a way of telling a story that is unique and intriguing. While there isn’t really much that is new about corruption and oppression (whether it be human or canine) Anderson’s tale keeps you interesting and engaged throughout. Man's best friend. They are faithful and true and generally loving. But what happens when man turns against them? Wes Anderson's (Fantastic Mr. Fox) stop-motion animation film Isle of Dogs offers a heartbreaking tale (or tail as the case may be) that makes you look at dogs in a way that you may have seen them seen them before but that is definitely still enjoyable. The story is one of survival and resilience and unfortunately, corruption told through the lens of dogs and one young boy. It makes you make you root for the canines and has you wondering if you would be better off befriending them more than humans. When an epidemic breaks out in Japan, Mayor Kobayashi (Kunichi Nomura; Lost in Translation) makes the devastating decision to ban all dogs and exile them to trash island beginning with his own dog – Spots (Liev Schreiber; Ray Donovan) as the first casualty. Over the years Trash Island has become permeated with feral dogs and they live by survival and instinct and an "every man for himself attitude". Back on the mainland, scientist Professor Watanabe (Akiro Ito; Birdman) has created a cure but he is murdered and his research all but destroyed. It seems all hope is lost. Unfortunately for Kobayashi, his nephew Atari (Koyu Rankin; Juken) misses his guard dog Spot so he confiscates a plane and crash lands on trash island in search of his beloved pet. In his search, he meets a number of dogs willing to help him locate spot but his Uncle has other plans. It seems Kobayashi was behind the plot to spread the disease and have all the animals banned from the City. He also got rid of his competition, Watanabe, in order to remain Mayor and to keep the dogs at bay. Of course, in the end, all of this comes to light and the dogs are saved! Anderson has a way of telling a story that is unique and intriguing. While there isn't really much that is new about corruption and oppression (whether it be human or canine) Anderson's tale keeps you interesting and engaged throughout. Perhaps it is his sarcastic tone or the detail given to the stop-motion animation that is interesting but for some reason, like a train wreck, you just can't look away. I'm sure that is also the reason he was able to recruit such a talented cast. The jaded stray Chief is voiced by Bryan Cranston of Breaking Bad fame. He is joined by Edward Norton (Birdman), Bill Murray (Lost in Translation), Jeff Goldblum (Jurassic Park), Greta Gerwig (Jackie), Scarlett Johansson (Avengers: Infinity War) and Francis McDormand (Three Billboards outside Ebbing, Missouri). There is also an interesting cameo by Yoko Ono. These veteran actors bring warmth and depth to their characters most of which happen to be dogs. Newcomer Rankin does a great job alongside these pros and the result is dialogue that keeps the viewer engrossed. The Blu-ray combo pack has two discs - a Blu-ray and a DVD- along with a digital code. The Blu-ray is 1080p high definition video quality with a 2.39:1 aspect ratio. The detail in the animation is clean and sharp and the colors are true and deep. Half of the enjoyment of this movie is looking at the visuals and appreciate the craftsmanship. I can only imagine what this feature must look like in 4K. The DTS-HD Master Audio 5.1 is crisp and layered with a driving drum beat soundtrack to add ambiance to the overall watching experience. Sadly most of the extras are short promotional videos that don't offer enough detail for my taste. I wanted to go much more in-depth into the animation process than was offered. 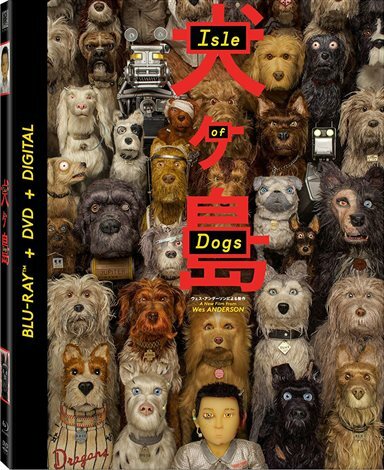 The extras include: The Animators, Isle of Dogs Cast Interviews, Puppets, An Ode to Dogs, Megasaki City and Trash Island, Weather and Elements, Gallery and trailers. As mentioned the plot is nothing new or unique but for some reason, the film works. In fact, it is interesting enough that I would like to watch it over again to see what little details I missed the first go around. Download Isle of Dogs from the iTunes Store in Digial HD. For more information about Isle of Dogs visit the FlickDirect Movie Database.